Nicolás Correa Service, S.A. is to be present as an exhibitor at the forthcoming edition of the International Fair of Bargain and Used Machinery FITMAQ 2015, to be held from the 26th to 29th May 2015 at the facilities of the BEC (Bilbao Exhibition Centre), in the city of Bilbao. All companies interested in making an appointment with our sales team, may do so through the following form. As exhibitors, NC service will have a 100 m2 stand at FITMAQ, where the company will be showing one of its most recently retrofitted machines, the high speed bridge milling machine CORREA EURO2000. With a travel of 2,000 mm on its X axis, 1,250 mm on its Y axis and 650 mm on its Z axis, this milling machine features a unique electro-spindle allowing it to achieve operating speeds of up to 10,000 RPM. With our presence at this second edition of the Fair of Bargain and Used Machinery, we aim to strengthen existing contacts whilst also looking to create new potential customers for our retrofitted used machinery. Over the last few years, this retrofitted or reconditioned machinery sector is clearly experiencing a boom. This is not solely due to the consequences of the economic crisis, which has led companies to seek pre-owned or retrofitted products and to rule out the former option of new products, but also due to a change in outlook in society, which has moved on from a "throwaway" attitude to one based on recycling. It is therefore possible to obtain a product that is of a better quality than before recycling, for enhanced product performance and a longer useful life. 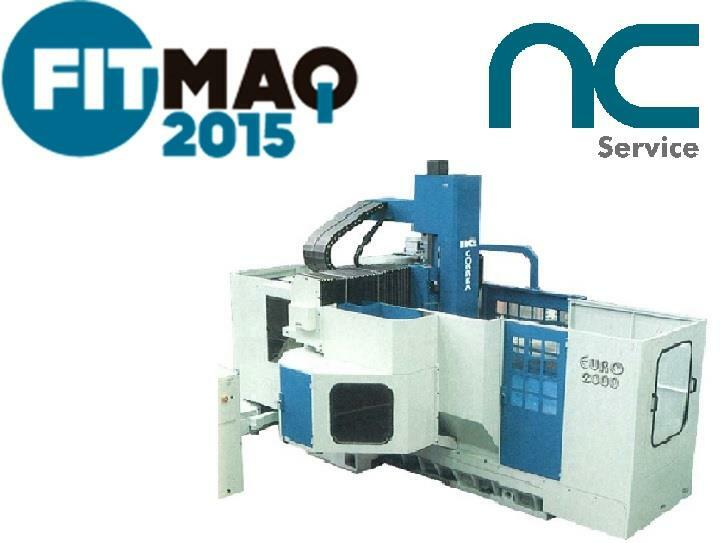 This is the second edition of the FITMAQ fair, which was held for the first time in October 2013, at which NC Service was also present as an exhibitor, showing the operation of the retrofitted milling machine Correa A30/30 first built in 2001. A year and a half later, this second edition of the fair is to be held, jointly organised by INTEREMPRESAS and the Bilbao Exhibition Centre. National and international companies buying and selling machinery, retrofitting companies, pre-owned machinery distributors, manufacturers with a stock of used machinery, service and repair companies, E-commerce companies, etc., will all be present in a unique setting in which visitors will be able to give shape to a whole range of business opportunities. Furthermore, four other events are to be held concurrently with FITMAQ in the various halls of the BEC, namely Subcontratación, Ferroforma, Pumps&Valves and Maintenance. Our commercial team will be at your disposal for showing you our stock of machines and meet your demands. To do so, you can make an appointment through the following form and we will be in Hall 5 – K-37.